Xeon Skylake-SP SKUs - Sizing Up Servers: Intel's Skylake-SP Xeon versus AMD's EPYC 7000 - The Server CPU Battle of the Decade? This leads to the following lists for the processors. We have sorted these into numerical order, which may be different to Intel’s pricing or specification lists. First up is the Platinum parts, geared for up to 8-Socket use. "One of the reasons for this is that sometimes a customer could take advantage of an 8-socket variant processor (due to high cache per core, for example), but would never consider it because the customer only needed a two-socket configuration. One of the reasons given for the naming is to alleviate this issue." 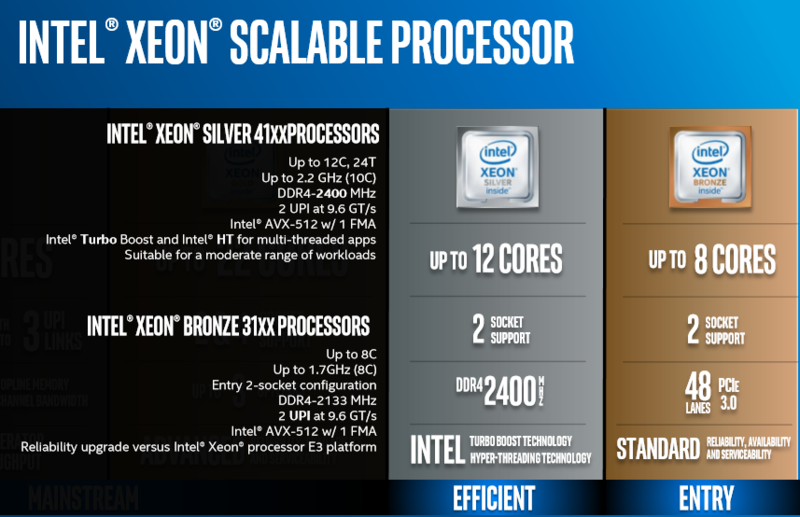 There is no longer an E7, but if you look at the prices ($3000-$13000) and features, the Xeon Platinum is clearly the successor to the E7. There is support for up to 8 sockets, and most of the Platinum SKUs have 24 to 28 cores, and is clearly using the XCC silicon. I suppose the first thing to note is the pricing. If you want the extended DRAM version of the 28-core CPU, be prepared to shell out $13k for the tray pricing. That is almost 2x the cost of the highest-end previous generation part, and becomes a sizeable chunk of any build. The standard DRAM support version is ‘only’ $10k. For anyone around the $7-8k per CPU budget, like last generation, you can still get a 28-core processor in the form of the 8176, or 8170 if you can give up a couple of cores. With the double DRAM supported parts, the 30% premium seems rather high. We were told from Intel that ‘only 0.5% of the market actually uses those quad ranked and LR DRAMs’, although that more answers the fact that the base support is 768GB, not that the 1.5GB parts have an extra premium. This pricing seems crazy, but it is worth pointing out a couple of things. The companies that buy these parts, namely the big HPC clients, do not pay these prices. They’ll likely pay under half these prices, and probably much less. Nonetheless, this is still a sizeable jump over the last generation – exact pricing for the top tier customers will be in their contracts, but it has been predicted by some analysts that there might be a small outcry, even from Intel’s largest customers. A few users might be confused about the Platinum 8156, a quad core part at $7007. This is a high cache/core part, offering 4.125 MB of L3 per core, up from 1.375MB per core for the standard parts. Intel has offered these parts for a few generations now, for customers that find their code to be L3 sensitive or have licensing agreements base on per-core/per-socket as well. What customers will have to note is that Skylake-SP has a different L3 cache compared to previous generations, by being a non-inclusive cache (and essentially a victim cache) means it will be used very differently. With a larger L2 cache as well, the L3 might become less important, or the fact it becomes a victim cache might make it useful/useless on the code. For customers after these sorts of cores, it is worth profiling the code on the CPU first, just to make sure. 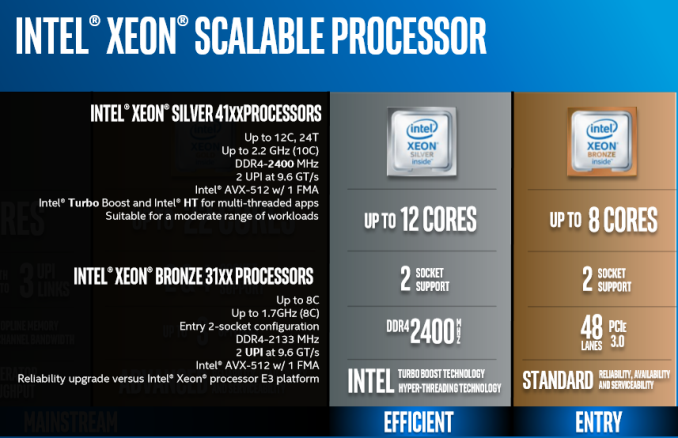 Despite some of the nuance, the Platinum processor list is easy to follow, especially by comparison to the Gold list. 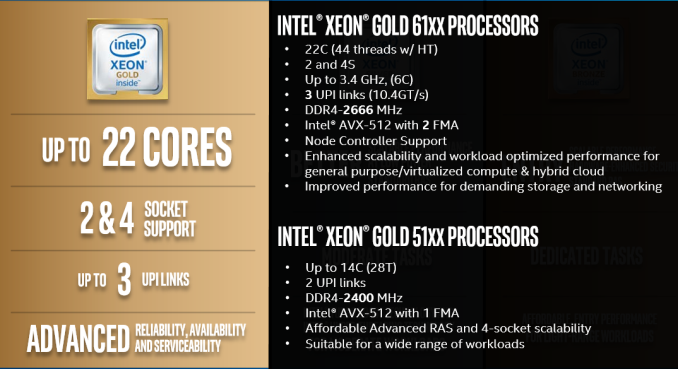 The Gold processors are technically split into two groups, the Gold 6100 series, and Gold 5100 series: split in their DRAM and AVX-512 support, as well as the number of UPI links. The Gold 6100-series will have 2 FMA units per core rather than one, showing that the Port-5 FMA is enabled and can feed the AVX-512 unit better for up to 2x performance. (This is similar to what we saw with the consumer Skylake-X parts, where >10-core parts have both FMAs enabled.) The 6100-series also has DDR4-2666 support, whereas the 5100-series is limited to DDR4-2400 as standard. There’s also a matter of UPI links to other processors. This matters when these processors are in a quad-socket system: with only 2 UPI links for the 5100-series, that means the processors are in a ring arrangement, rather than a hatch-arrangement, and to access data on the opposite side of the ring requires two hops, rather than the one hop on the hatch. This is perhaps a niche issue, but one worth taking note of. Why all those differences between the two grades of Gold did not result in a separate "grade" for the 51xx is beyond me. For example, for the HPC people, the 51xx gets you slower DRAM and half the FP peak performance. The only logical way to describe the Gold grade is "the 4 socket version with wildly varying features". After 16 CPUs for Platinum and 32 CPUs in Gold, the Silver and Bronze parts only have 10 in total. These parts support two sockets at most, and only up to 12 cores, showing that Intel’s market segmentation strategy has changed significantly here. In the last generation, a customer could get a dual-socket high-core-count part like the E5-2699A v4 without the need to look at 8-socket parts, but now Intel has that limited such that you have to look at Gold or Platinum processors to play in this space. As with the Gold 5100 series, these Silver and Bronze parts only have 1 FMA per core for the AVX-512. The Silver parts support DDR4-2400, hyperthreading, and UPI at 9.6 GT/s (down from 10.4 GT/s on Gold), compared to the Bronze CPUs that use DDR4-2133, no hyperthreading, the slower UPI, but also slower in general – peak frequencies are at 1.7 GHz with AVX-512 at 0.8 GHz. It is worth noting that Intel’s documents, such as the price lists do not list these parts in numerical order. At times the higher core count part will be listed higher than a lower core count part with more cache/frequency, and this will be non-obvious, especially when quick glancing. In general, the higher the number, the higher the raw performance is (Cores, frequency), but this does not always hold true. The Platinum 8170 (165W) has only 2 cores (8%, 26 vs 24) more than the 8168 (205W), but the latter has an almost 30% higher frequency (2.7 vs 2.1). So maybe the higher the number, the better the performance/watt? This doesn’t hold either, because the 8164 (150W) runs 26 cores at a 2 GHz. The Gold 6144 and 6142 look very similar, but the former is an 8-core at 3.5 GHz (with 25 MB of L3), while the latter is a 16-core at 2.6 GHz (with 22 MB L3). The new numbering and grade scheme has some merits, but there are still too many exceptions to rely on it. Especially the Gold grade having two sets of parts, and the last two numbers are not logical at all. You will still need to decipher every SKU at ark.intel.com to know what you are buying.